I have roosters in my flock. I always have. I like them actually, although many people prefer to just raise hens. 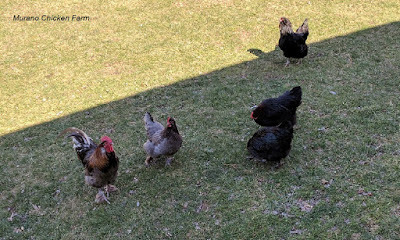 Of course you don't need a rooster in your flock for your hens to lay eggs, but there are many reasons why you might want one. Then again, there are a few reasons why you might not want one. Like the crowing. Many people don't like the crowing much. Rooster crowing doesn't bother me, it's not that loud after all. Except for the crowing contests, but that's a different story. Plus, I'm out in farm country so nobody really cares about crowing out here. Most of the neighbors aren't even close enough to hear it! Of course if you live in town you may not even be allowed to have a rooster. If you are allowed to have a rooster where you live you've probably contemplated whether you need one in your flock or not. Trust me, you do! I like to think of my rooster as the coop boss. He takes care of things for me because I can't spend my whole day out there. He has 4 main tasks that he performs for me. Protect the hens: A rooster will protect the hens from a perceived threat. Yes, that means that sometimes they think that threat is another rooster, the neighbors cat or your pink barn boots...but mostly they know what to protect the hens from! I once heard a ruckus and ran outside just in time to see my rooster launch himself in the air and come down right on the back of a hawk that was attempting to grab a hen! The hawk screeched and flew off while the hen ran to the coop to hide. Of course the rooster crowed a long, loud victory crow! Another rooster was killed by a bear who had tried to grab one of his girls. They will fight to the death trying to protect the hens but in cases like the hawk issue, the hawk lost and never came back. They can be an excellent deterrent for smaller predators. Fertile eggs & hatching chicks: Obviously if you want to raise your own chicks you'll need a rooster so the hens will lay fertilized eggs. If you want to make money from your flock the most profitable way is to sell either fertile hatching eggs or chicks. Most people just sell extra eggs for eating, but the profit margin is much higher on chicks than on eggs. If you want to have a high fertility rate, I recommend 1 rooster for every 8 hens. If you happen to have a hen that goes broody every year, it's much cheaper to let her raise some of your own chicks than it is to buy her hatching eggs or chicks. Find food for the hens: Roosters will forage for food and call the hens over when they find something tasty. Since he wants the hens to see him as a provider he actively searches for bugs for them. I figure the more bugs they eat the better! He will also call the hens over when I bring feed out to the coop or throw treats out. The rooster ventures away from the coop with the hens to free range and I'm confident that not only does he help them find lots of yummy bugs and such to eat, but he can protect them if something sneaks out of the woods towards them. Somebody has to be the boss: the pecking order is very real hierarchy and a rooster can help keep the balance. Often times if there is no rooster a hen will step up and take on the roosters responsibilities. Some times this means she will cease laying and even start crowing. I once saw my little cuckoo silkie hen crow and I just about fell over in shock! Many people don't want a rooster because they don't want the expense of feeding a chicken that's not giving them eggs. If a hen takes over the roosters duties you could end up feeding a chicken that's not producing anyway. He's just so pretty: Roosters have a few things on hens when it comes to attractiveness. Like many members of the animal kingdom, the male chicken has a more showy color combination than the female. Their tail feathers are long and tend to bend over at the end from the length. They have long, pointed colorful saddle feathers. A roosters hackle feathers are thin, pointed and often colorful. In contrast the hens feathers are all shorter and rounded at the ends and she's generally less flashy looking. Which isn't to say that hens aren't pretty, they are. It's just that roosters are like, super fancy! I've always had roosters in my flocks. I think the benefits outweigh the negatives. 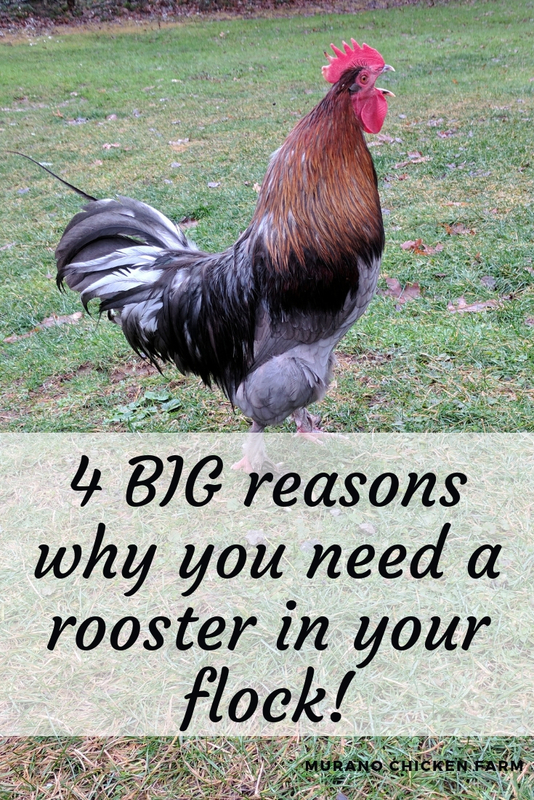 Sure, roosters can get ornery and some can need a bit of training to make them friendly. On the whole though, I think every flock needs a rooster. Do you have a rooster in your flock? Related reading: How to add a rooster to your flock. We have a rooster/cockerel, I just like them, they are normally good looking birds, I enjoy watching him crow and we have just hatched his first off spring, only issue I have with roosters/cockerels is the feather damage they inflict on our hens even with his flock of ten it still happens. I like the crowing too! Have you considered getting saddles for your hens to minimize the damage the rooster does to their feathers? They really help a lot. We have previously made some but had limited success, as the birds free range and are out in all weathers (even though many shelters are available for them) often the saddles just got wet and muddy, we have just purchased some waterproof material to experiment with so we shall see how that goes, we are also adding more hens as they become old enough to withstand the cold and integrate so his harem will increase, hopefully helping as well. We do find though that he has his favourites and these are the ones we need to help.